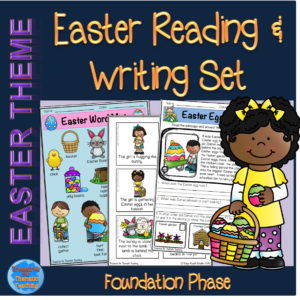 Easter Reading & Writing Set Foundation Phase – Teacha! 1. 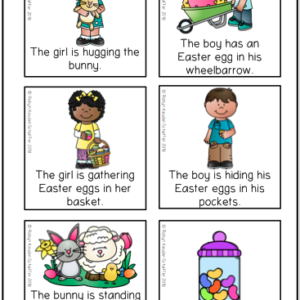 WORD MAT: The word mat has some basic words to assist in building vocabulary for the theme. 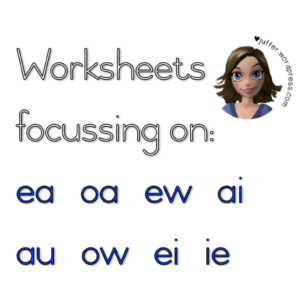 Read through the words as a class and discuss any new vocabulary. 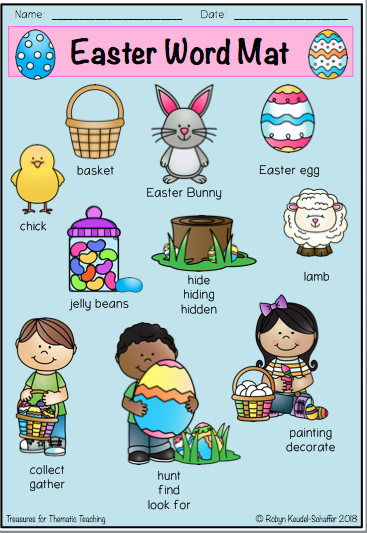 These can be used to assist with spelling when children are writing Easter themed sentences and stories. Encourage speaking and use of vocabulary by asking students to say a sentence with one of the words on the word mat. 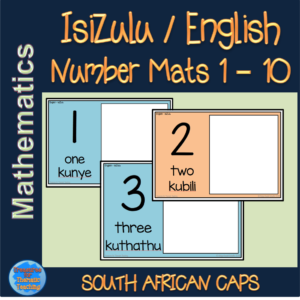 The word mats are also great to encourage discussions and promote other language aspects. 2. 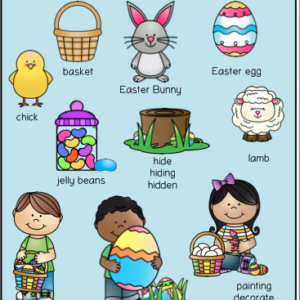 EASTER WORD SEARCH: I have put this sheet in to assist with the spelling of new vocabulary and to help familiarise the students with the vocabulary. Again you can encourage speaking and use of the vocabulary by asking the students to say a sentence with one of the words they have found. 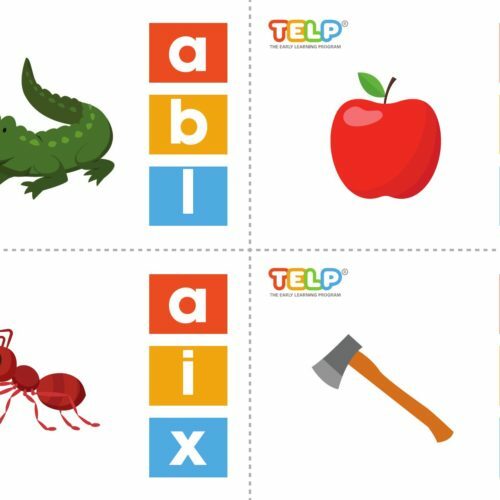 You can also ask them to choose three or four words and draw a picture to illustrate the words. 3. PICTURE AND SENTENCE CARDS: I have laddered the activities. Going up from just the pictures and words to now reading sentences to go with the pictures. I would recommend printing two sets of the cards for games. I laminate them for durability. There are many ways these cards can be used. 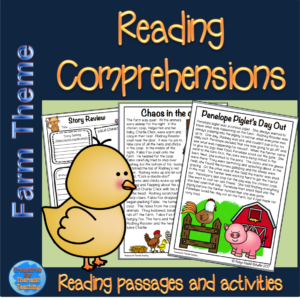 Use them simply by getting the students to read them. This helps them become more familiar with the vocabulary. Play games such as snap or memory. I also like playing a memory game where you layout some cards. The children need to look at them and then turn away. You remove one or two and shuffle the cards around. The children then need to look again and tell you what is missing. 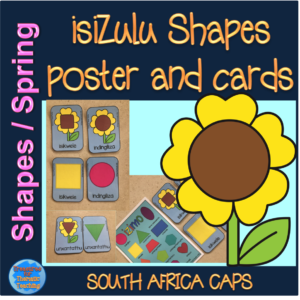 Encourage speaking and story telling by getting the children to choose two or three cards. They then need to tell you a story based on the cards that they have. Another fun game is to start with a card. Children sit in a circle and develop a story from that one card by each having a turn to add a sentence. This can end up being very funny. 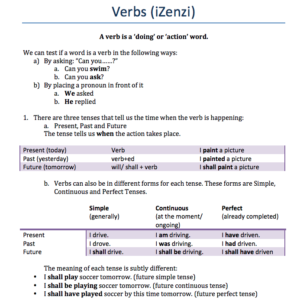 Encourage the children to be aware of tenses when doing this and also encourage them to listen carefully to what others say so when it is their turn to add on a sentence it makes sense. 4. 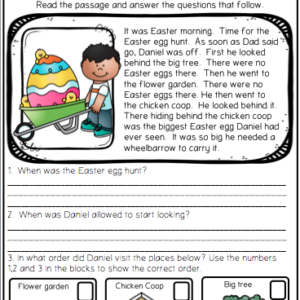 READING COMPREHENSIONS: There are five Easter themed stories with questions and activities based on the stories. These are set from easy to more difficult. The stories can be used as prepared reading passages. 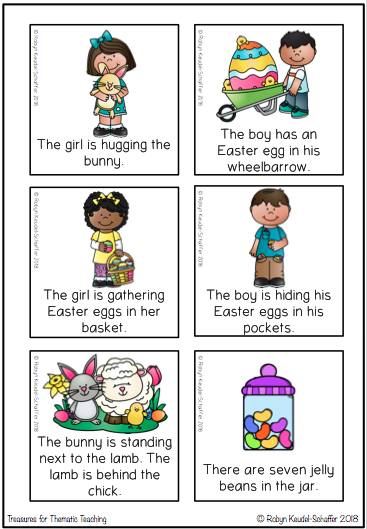 Another fun activity is for the students to use the story as a base for a short skit or play. 5. WRITING ACTIVITIES: Here again I have laddered the activities. 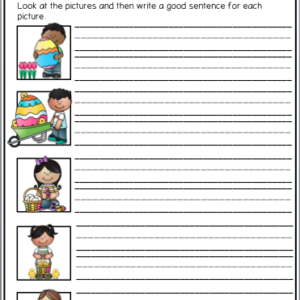 I have a sheet with pictures and the children need to write a sentence about the picture. 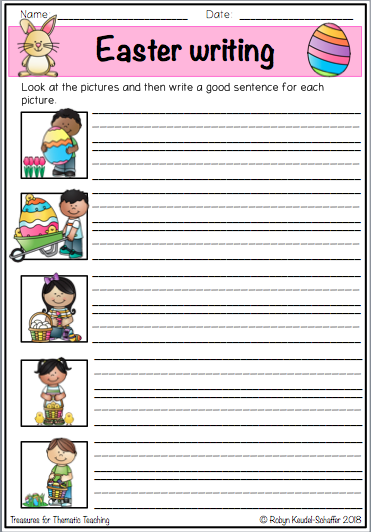 The next sheet requires the children to write five of their own sentences. It also asks them to check their spelling, capital letters and full stops. 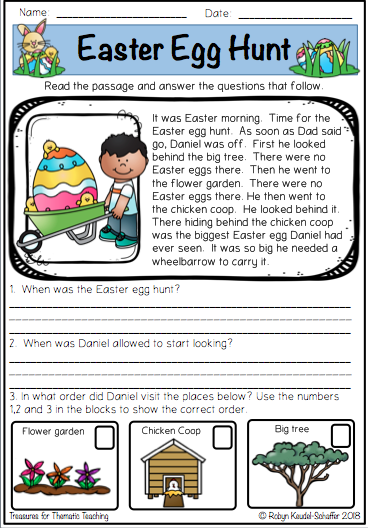 The final writing task gets the students to plan and write their own Easter themed story. There is a self- assessment checklist for the students to use. 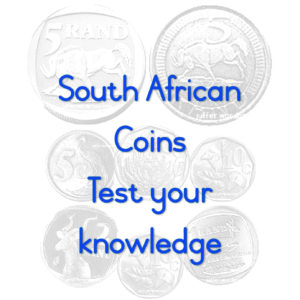 I have included a simple assessment checklist that teachers can use to assess this task. 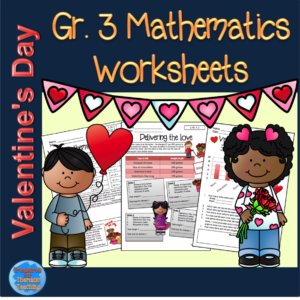 All the worksheets come in B&W or a colour version. I have included a document with suggested answers for the comprehensions. 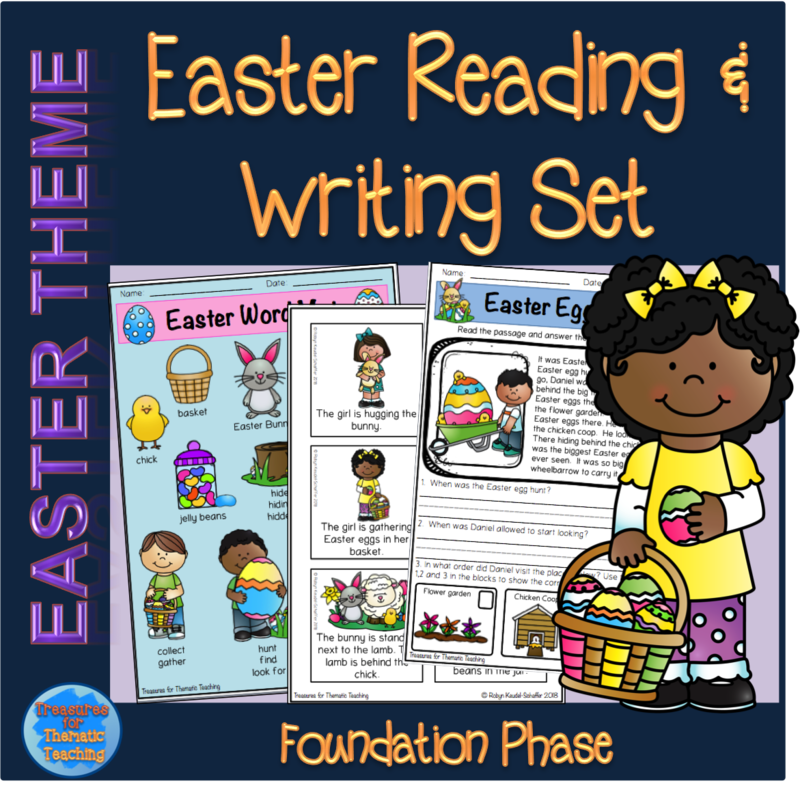 Please visit my store for more themed resources.